I have subscribed to Apple’s $9.99 highest-level storage plan for a couple of years, not being convinced of Dropbox’s lasting power (although I love Dropbox), data security (I have had to change my Dropbox password due to a data breach), and of course, improvements with iCloud. This means that I can store my most valuable data in Apple’s cloud system without worrying about failing drives or even stolen equipment. My most important documents, my music library (scanned and audio), and photos are all safely in the cloud for $120 a year, and Apple keeps increasing the amount of storage included in that pricing (now 2TB of data). Apple doesn’t seem to hold audio files or pictures against that total storage…although I do pay $25 a year of Apple Match (it takes all of your music and puts it in the cloud, also allowing you to re-download) and have not yet subscribed to Apple Music, although I think that subscription is coming, too. With that online storage, I am able to backup my personal devices without any fear of running out of room. Sadly, the minimal 5GB that Apple allows for every iTunes account does not help much, and you end up buying storage for devices. I wish there was a way my family could tap into my 2TB of data, as I pay $0.99 for my wife’s devices and really should upgrade to $0.99 for our children’s iPads. We do use family sharing…but I wish there was family sharing for device backups. Well, my new iPad Pro arrived yesterday afternoon–the afternoon of my last contract day (students were done on Friday), so receiving the iPad felt like a bonus for surviving the year. I will blog more about the year later–but I need to distance myself from it for a while before I do so. What you read about the iPad Pro (12.9″) is true. It is huge, it is fast, and it has the potential to change your workflow. This morning, as I did my daily routine of having breakfast, doing devotions, and reading the news, my workflow was modified by having my journaling app (Day One) and my Bible reader of choice (Olive Tree) up at the same time. I could do this on my iPad Air, but doing so makes the split screen of limited use as space is minimal. I am learning how to utilize the new screen space, and am really looking forward to reading music on it. I get my first opportunity to do so this afternoon as a small group of ukulele players are playing for a Veteran’s retirement home–unintentionally on Flag Day (incidentally, happy Flag Day!). I am figuring out how to integrate the Apple Pencil into my work flow. I have used a stylus before, but this device changes many interactions with the iPad Pro (and yes, with the latest iPad Pro, there is no perceived lag or latency). I just wish there was an “eraser” on the end of the Pencil for apps like forScore. Back to the topic at hand…as my devices are set (in Settings) to back up when “sleeping” and plugged in, I am basically ready to upgrade or migrate at any time. All I have to do is open a new device, go through the starting menus, tell the new device to restore from a backup, and then Apple restores the data. Apple doesn’t store the Apps with your backup–those download directly from Apple. All that downloads from your backup file is app data–which is relatively small (most of the time–there are exceptions, such as video files). Then, over time, Apple restores all of the apps you had on your device, and for the most part, you are ready to use your new device. Occasionally you will need to enter a password (such as with WordPress, which I use to blog), but that is a minor inconvenience. I think a larger task would be the challenge of migrating from iOS to Android or Android to iOS…and even then, the carriers and companies have tools to help you migrate. If you have been putting off the purchase of a new device because of the challenge of setting it up, and you want to use the existing setup on your current device–simply use iCloud Backup and the migration is pretty painless…it just takes a while to download everything. One other tip: don’t erase your old device until you know that you have restored everything to your new device (or until you know that you will keep your new device)–just in case. 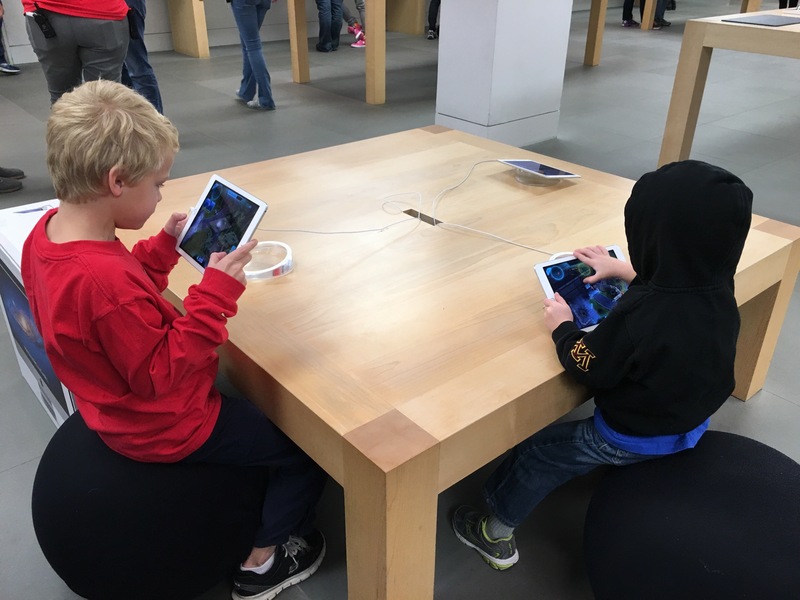 I am currently at the Apple Store at the Mall of America. My boys like to play the demo games in the kids area (my wife and I take turns looking at things), so that gives me a chance to try new products. 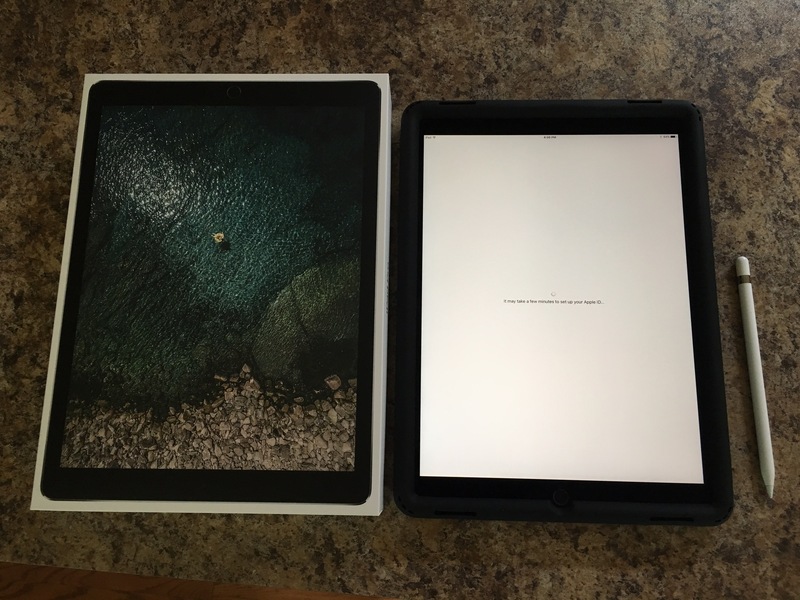 The iPad Pro is simply huge. The tech columns simply can’t make it possible to understand how big it really is. You need to see it and hold it for yourself. forScore is a demo app on the device, and it looks GREAT on the iPad Pro. The home screens need to be thought out more–there is simply too much space between the apps. This will get figured out over time. The device is fast (I would love to see audio rendering time with Notion). The Apple Pencil feels great. I only used it for a few minutes, but it works perfectly on the screen, and it is angle aware. It is a pencil as pen replacement. The only thing I worry about is losing a $100 stylus. The new iPad Pro keyboard cover is okay. It works, and you could certainly do real work on the device. I don’t know if I would buy it. With the keyboard cover, the device is bigger than most notebook computers. If Apple can put missing productivity apps on this device (iBooks Author, XCode, Final Cut, and Logic Pro)–which is faster than the new MacBook–this really could become a notebook replacement. I think Notion on iPad Pro will be wonderful; you have the potential for much more workable space (compared to the iPad, the iPad Pro version could use less equivalent space for keys and stil have larger keys). For me, though, music reading is going to be my primary use for the iPad Pro–and that is why I will eventually buy one (although I would still like to see 3D Touch on the device). It is a good thing that I still need to wait a year. The iPad Pro is now available. Am I going to get one? No. I am selling all my iOS and Apple devices and going 100% Chromebook. Okay, that last line was a lie–I am feeling under the weather and a joke made feel a little better. I'm still not buying an iPad Pro. There are a few reasons. I bought my iPad Air 2 in March from T-Mobile and still have 16 no-interest payments to make on the device. I feel strongly that the next generation of iPads will come with 3D Touch. While a recent survey of iPhone 6S users showed that most owners do not use 3D Touch, this is partially because we are not yet used to using it, and partially because app developers have not integrated the feature. In time, 3D Touch will be a standard gesture, like pinching today. I will eventually get the iPad Pro from T-Mobile on the Jump On Demand plan. Should YOU get the iPad Pro? 3D Touch won't likely be the issue for you. I read today, quite accurately, that the iPad Pro is cheaper and faster than Apple's new MacBook (I also need a new MacBook). I expect Apple to address the speed issue soon…but put another way, the iPad Pro is almost two times as fast as the iPad Air 2, which I own. That is crazy-fast. Apple's Pencil is back-ordered, but that will be a nice device (I am asking my parents for the non-Bluetooth Adonit Jot Dash for Christmas), and Apple iPad Pro keyboards and other devices will be out soon. forScore tweeted today that music looks GREAT on the iPad Pro, and that the sound is better than a laptop (four speakers on the iPad Pro). forScore also reminded us that the original Music Pad Pro was $899…the 32GB iPad Pro plus the Pencil is still cheaper than the Music Pad Pro, plus it can do so much more. I don't think of the iPad Pro as a MacBook replacement, at least not until all of Apple's apps can run on the device (or more specifically, iBooks Author, Final Cut, and Logic Pro. While these programs cannot run on iOS (at least not yet), the iPad Pro has the power to run them. Tim Cook (CEO of Apple) has taken some recent shots at Microsoft about the Surface Pro 4, calling it “deluded.” I don't think that is fair–the device itself is fantastic, but it is really, really hard to make any device–and a device that is both laptop and tablet has to make some sacrifices. Some of that will come in the operating system itself, other sacrifices occur with developers. While the Surface Pro has Staff Pad as a unique music solution (there are other solutions, such as PhotoScore Ultimate with NotateMe), that program generally only works best with the Surface line of devices. Most programs are not created with the Surface (or multi-touch) in mind, Microsoft has finally figured out that to provide the best experience, you have to control both the software and the hardware. If I had an extra $1400, I would certainly buy a Surface Pro 4 to work with (I only have my $230 Asus T-100). While Apple has been introducing parts of iOS into OSX (and vice-versa), they are trying to do so when it makes sense to do so. Years later, they are finally getting the hang of cloud computing (although I do believe if Dropbox had agreed to be purchased by Steve Jobs, Apple would have taken the lead in cloud computing). Still, Apple is committed to iOS and the Mac. And that's okay. 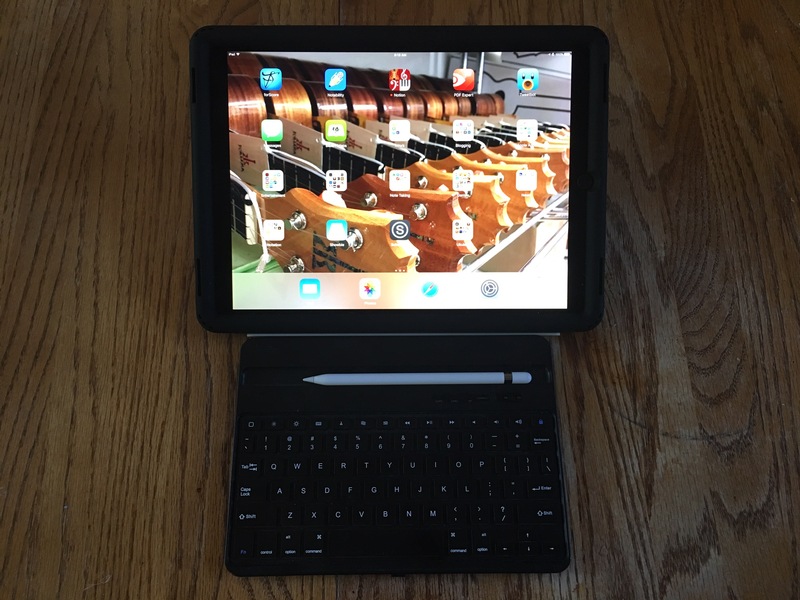 So…if you want an iPad Pro, go for it. It should be functional for five years (if not more), as tablet speeds are catching up with (or surpassing) notebook speeds. You just might miss out on some of next year's features, unless you get your iPad Pro with T-Mobile's Jump On Demand. In that case, you would always have a monthly payment, but you would also always have the latest and greatest device at your fingertips. Note: I do not get a referral bonus from T-Mobile.